This supercar driving experiences give you the opportunity to get behind the wheel of two of our latest supercars right here at Ingliston Circuit. Arriving at the venue, you’ll immediately get a feel for the event with the fleet of supercars taking to track and other guests eagerly awaiting their drive. You’ll check in with the events team who will then provide you with a full safety briefing and track familiarisation. Today you will experience the subtle difference between two of the best models ever to come out of the famous Italian supercar brands. Then you’ll venture out on-track where you’ll put your chosen supercar through its paces. Testing your skills on the straights and corners, you will get three laps to experience the capabilities of this supercar. You can purchase as many extra laps as you would like on the day. Our ARDS trained instructors will give you driving tips from the passenger seat, empowering you to get the best from the cars and the track. The Ferrari 458 Italia Spyder comes in Ferrari red with the classic Italian tricolour detailing. The V8 turbo charged engine produces 660 bhp delivered through a 7-speed double-clutch transmission. 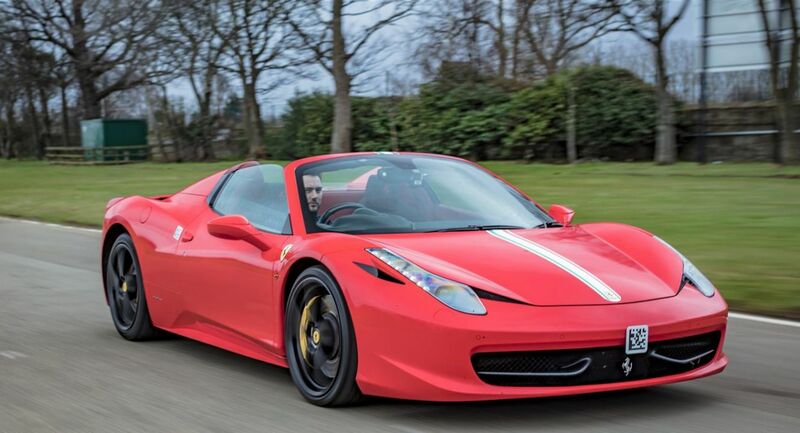 The 458 completes 0 – 62 mph acceleration in just 3.0 seconds. the Huracán is the latest car in the line-up of Lamborghini’s. The lime-green convertible body is very eye-catching, as is its performance, offering a screaming V10 engine offering the 0 – 62 mph acceleration in 3.4 seconds, also through a 7-speed double-clutch. With your instructor in the passenger seat, you’ll venture out towards the track where you’ll put each car through its paces, in three laps. Testing your skills on the straights and corners, lap by lap you’ll experience the capabilities of the high-performance supercars. The supercar driving events take place on the South Track which is made up of the southern part of the original Ingliston Circuit between the exit from Esses, through the Hairpin into the Left-hander, connected with a newer section of track to complete the circuit. Racing legends including Sir Jackie Stewart, The Late Jim Clark and even Noel Edmonds have taken to the infamous circuit, now it is your turn. Ingliston Driving Experience venue is situated with the Royal Highland Centre. The original circuit was built into the venue in 1965 and although motor racing ended in the mid-ninteis, a recent investment in the track has lead to a resurgence in motorsport on the circuit.